Calling card of a person whose name appears to be Ada Oellermonn. 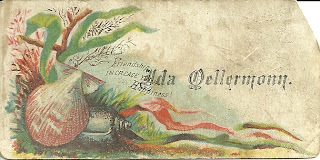 Unfortunately, I wasn't able to find an Ada Oellermonn online. I also tried Ada Oellermann and Ida Oellermonn and Ida Oellermann, without success. Then I tried using the surname alone and still was not able to come up with a Census record for a person named Oellermonn. However, I did find some folks with the surname Oellermann, so perhaps that is the correct spelling. If you have any insights into the identity of the owner of this calling card, please leave a comment or contact me directly.